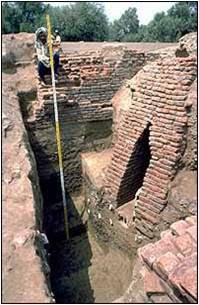 million.had homes which were usually built from dried or baked mud or clay bricks,including Harappa and Mohenjo-daro.Mainly the portion of the buildings of large cities where contamination with water was possible,burnt bricks were used and for other parts sun-dried bricks were usually used.Only between approximately 2600–1900 BC,in the Mature Harappan phase,were baked bricks used in quantity,especially for walls and ﬂoors exposed to water.Stones were not used except only one large city,Dholavira,where buildings were made of sun-dried mud bricks and stone.A few other materials were also used to make the roofs,floors,interior walls etc.Although hundreds of sites have been identified,only few cities have been yet excavated.Harrapa was the first town discovered,Also all cities are believed to have independent rulers,even though they are part of the same single state.With few exceptions,most other buildings would be made from regular sized baked bricks throughout the town,A common size was 7 cm high x 14 cm wide x 28 cm long.with ratio of 1 : 2 : 4 .There is some evidence, the IVC may have been transporting the bricks between towns.This is the reason the bricks are the same.The IVC domesticated the elephant and were among the first to develop an efficient type of wheeled transport.Stone was used only very rarely in very important structures. 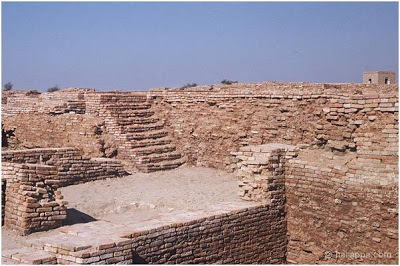 Buildings of Harappa & Mohenjo daro were unique to the ancient world & they used sophisticated technology to build planned cities with a grid pattern of wide,straight streets & fortified with surrounding thick walls and great baths.Most of the scholars are still wondering how did these remarkable people acquire knowledge of such sophisticated technology?The details of the bricks they used to build these Amazing and Wonderful buildings were never recorded by these Indus valley people.However some details of the bricks could be find from Shulba Sutras[Sulvasutras] of 500-600 BC,considered to be appendices to the Vedas.“Sulba Sutra” by some is dated to 10th century BC or perhaps older.TheŚulba Sūtras enumerates the rules for the construction of Vedic fire altars with bricks of various sizes.Here the brick is mentioned as istaka.Though the Controversy over the exact orgin of the word istaka is still going on as any indo-aryan/Indo-european languages failed to give any explanation,the Dravidian languages gave explanation for the word istaka. 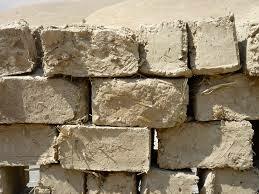 For example,Telugu words for brick is Iṭuka[ఇటుక],kannada word is Iṭṭigeyinda [ಇಟ್ಟಿಗೆಯಿಂದ],Malayalam word is iṣṭika (ishtika)[ഇഷ്ടിക] & Sangam Tamil word is ittikai[இட்டிகை]Hence we can easily assume that it is Dravidian in origin, though eventually borrowed by the vedic peoples,once they defeated the Indus people & settled down there temporarily before they [the Indo-Aryan people] moved to northwestern parts of the Indian subcontinent and spread to the Ganges Plain and wrote Rig veda & other later texts such as Sulba Sutra etc .Also we find that Ista occurs in Rig Veda in the sense of worship or sacrifice which was not connected with brick at the early stage.Had it been so, istaka could have been used in the Rig Veda, as it was done in later texts.There are twenty-five or more Dravidian words in the Rig Veda, and also has noticed 85 or more such words in later Vedic Texts.All these confirm that the details of bricks found in Sulba Sutra might be borrowed from Indus valley people.Also we find that In the Vedic India houses were built from wood,bamboo, strawmats etc only.This also again indicates the origin of the word istaka,probably from pre-aryan culture.We are now in a position to explain firmly that the speakers of Indo-aryan who came to India through Afghanistan, through the Khyber Pass and onto the Indus Plain picked up this word from Indus people,ancestors of Dravidian people. 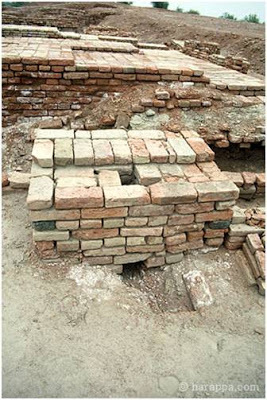 Shulba-sutra, which shows in details how to make the fire-altar construction with different geometrical shape by unique sizes,shape and arrangement of bricks.Sangam literature,Akananuru also indicate that the place constructed by Itikkai[இட்டிகை] is called fire altar.Hence when you link both,you will easily understand the wide knowledge of kiln fired bricks of Indus valley people and the links between Tamils & IVC.. 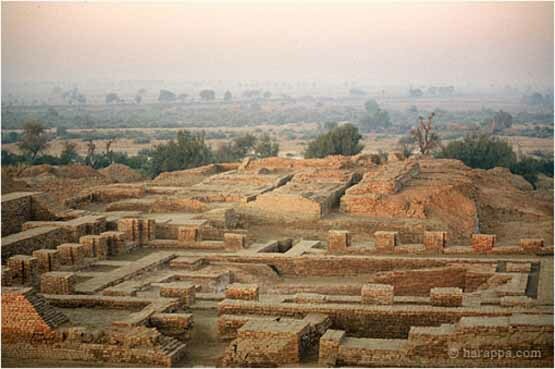 The lay-out and planning of Indus Valley towns was generally very structured.So,It's much easier to make many bricks that are exactly the same than to cut stone in standard sizes,especially before modern tools.Every Indus Valley town used roughly the same city planning.They used the same standard sized bricks in their towns.The bricks invented by the Indus Valley Civilization were exceptionally strong and thus have still survived today,4000 years later.While stone is still stronger,its difficult to cut exactly flat on four sides,as they used chisels,pickaxes,and saws,most likely made of copper.The brick walls of Harrapa are very straight and that allows for the city to be planned into neat quadrants.The IVC also rebuilt their homes and public spaces on top of the old ones every few years,yet they were able to keep the straight angles in the city planning design due to using brick,because its easier to stack neatly with brick than stone without any extra efforts.Due to their geography,which caused constant flooding,these rebuilding efforts were constant.Hence brick may be better suited for the IVC,even though Stone is much more permanent and makes sense.